This entry was posted on Sunday, December 18th, 2016 at 12:29 am. I’m way behind with this review as I finished this one almost a year ago – yikes! A Portion for Foxes, by Jane McIlvaine McClary, was published in 1972, so there is definitely an ages-old feel to it, but that shouldn’t stop you for giving this one a chance. 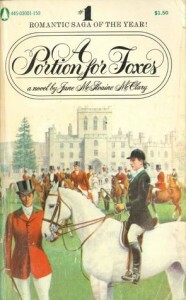 I learned of this book while reading Michael Korda’s Horse People, his memoir about life with horses. As an editor for Simon and Schuster, Michael remembers working with Jane, editing her novel, and visiting her at her Middleburg farm. It is about Jane that Michael wrote one of my favorite lines – how true would this be for me if I had actual human kids? Anyway, A Portion for Foxes takes place in the 1960s in “The Valley.” We can assume that The Valley is Middleburg or some other nearby well-to-do Virginian equestrian enclave. Through main character Shelly Shelburn Latimer, we learn how this southern foxhunting community is evolving due to the Civil Rights Movement. Some members of society, including main character Shelley’s “Yankee” husband, Mike, help lead the movement. Other members, stuck in the past, cannot embrace the changing times, so in that way, this can be a difficult, heartbreaking read. Interwoven throughout the politics is the theme of genteel poverty. Behind their large estates, fabulous foxhunters, and fancy schools, the people of The Valley are struggling, Shelley particularly. She feels both held back and down by her family’s name, yet doesn’t seem to know how to rise above her surroundings. This is a long book – 607 pages long, and while I did put it down a few times, I always came back to it. I tend to gravitate to novels in which I like and/or can relate to the main female character, but this was not so with Shelley. She remained a mystery to me throughout the entire book, and she made multiple decisions that had me wanting to reach into the pages and give her a good shake! Get it together, Shelley!